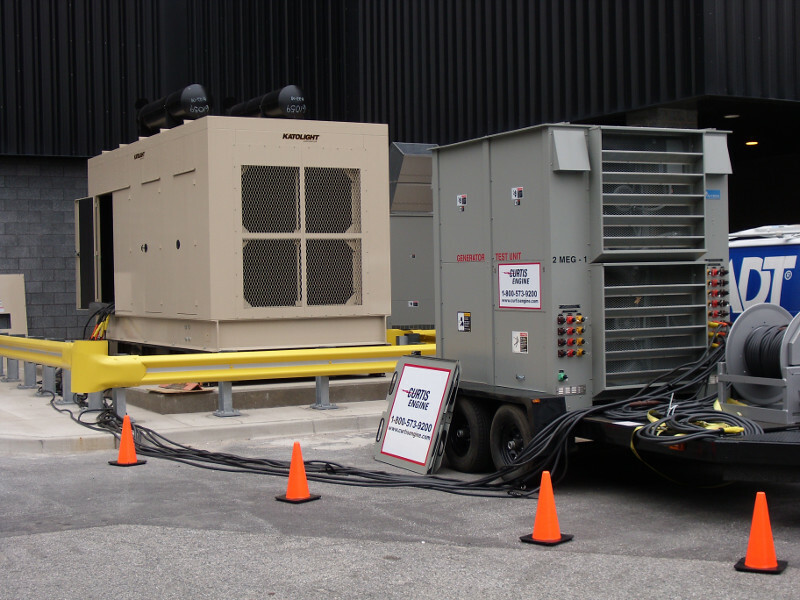 CURTIS ENGINE OFFERS LOAD BANK TESTING SERVICES TO SAFELY PROVE YOUR GENERATOR SYSTEM WILL PERFORM AT ITS FULL CAPACITY IN AN EMERGENCY. Load bank testing confirms the emergency power supply system’s ability to run up to its rated kW output and stay there without overheating and possibly shutting down during an emergency. Periodic load bank testing is an essential part of any good maintenance program. Load bank testing is not intrusive and during the test, there is no interruption to the facility’s power supply. Allows engine to reach proper operating temperatures and subjects the engine to actual operating conditions. Ensures that the generator will reliably operate at its maximum capacity for an extended period of time. Prevents and corrects “wet stacking” – a condition where unburned fuel deposits accumulate in the engine and exhaust system reducing the generator set’s efficiency. Exposes problems under controlled conditions with a technician present – not when the power is out! In addition to providing peace of mind, load bank testing is required to ensure compliance with NFPA 110 and Joint Commission standards at hospitals, nursing homes, computer data centers, and other critical facilities. Curtis Engine has portable resistive load banks in multiple size ranges from 100kW up to 2MW and totaling over 5 megawatts of load bank capacity. Our qualified technicians set up the equipment, perform the test procedures for the appropriate length of time and provide a written report detailing the performance of the equipment being tested when complete. During a load test, critical engine and generator parameters such as oil and fuel pressure, operating temperatures, voltage, frequency, amperage, and kW output are measured and recorded throughout the duration of the test. Typical load bank tests range between two and six hours and the results are recorded in 15-minute increments at up to 100% of the generator’s rated capacity. Most backup power systems should be load bank tested to full capacity at least once per year in addition to weekly no-load exercising or monthly transfer testing with available loads. Load bank testing is the only way to safely test your generator set’s ability to perform without risking a total loss of power or power quality by interrupting utility service. To schedule a load bank test or for more information, please contact us. NFPA 110, Standard for Emergency and Standby Power Supply Systems (EPSS) covers performance requirements for power systems providing an alternate source of electrical power in the event the primary power source fails. The standard addresses installation, maintenance, operation, and testing requirements for generators and automatic transfer switches (ATS). Diesel generator sets shall be tested monthly at not less than 30 percent of the rating. for a total of two hours of continuous operation. Load Bank Testing also provides peace of mind and insures compliance with NFPA 110 and JCAHO standards for hospitals, nursing homes, computer data centers, and other critical facilities. NFPA 110 Section 8.4.2.3 states: “Diesel-powered EPS installations that do not meet the requirements of 8.4.2 shall be exercised monthly with the available EPSS load and exercised annually with supplemental loads at 25 percent of the nameplate rating for 30 minutes, followed by 50 percent of the nameplate rating for 30 minutes, followed by 75 percent of the nameplate rating for 60 minutes, for a total of 2 continuous hours”. In addition to NFPA 110, the Joint Commission on Accreditation of Healthcare Organizations (JCAHO) added an additional requirement in 2007 that health care organizations test emergency generators at least once every 36 months for a minimum of 4 continuous hours (JCAHO EC.7.40).